Is there anything more depressing than a cubed, unripened piece of cantaloupe in a plastic fruit cup? 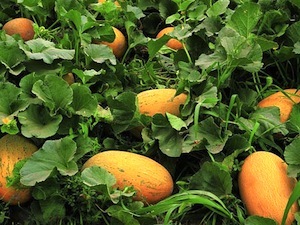 Continually served year-round, or maybe balled and placed in watermelon salads at picnics from time to time, muskmelons seem to have a very placid and unadventurous life. Unless, of course, they live in Europe, where they are granted some luxury: served only in season, willingly sliced, and draped lovingly with prosciutto. I wouldn’t doubt that on this Memorial Day weekend, those hungry for summer foods may be reaching for a melon or two. It’s the dream of summer approaching, when even the lavishness of spring seems to linger too long, and we want the sun to warm our bodies and refreshing drinks to cool them down. However, we need not settle for the same boring treatment of the dear melon. Instead let’s give its first seasonal arrival a decent welcome. Let’s celebrate. Let’s use them to make salsa! NOTE: If you really really like things spicy, add two tablespoons of olive oil to your salsa recipe. Oils hold onto the capsicum in the peppers and spread them around in the mouth. “How masochistic!” you may say, but those who love spice, know that a bunch of endorphins will come to the rescue and make you feel happy as happy can be. NOTE: Do not use metal bowls for this recipe. The acid from the juices could also clean your metal bowl and leave a slightly metallic taste to your salsa. 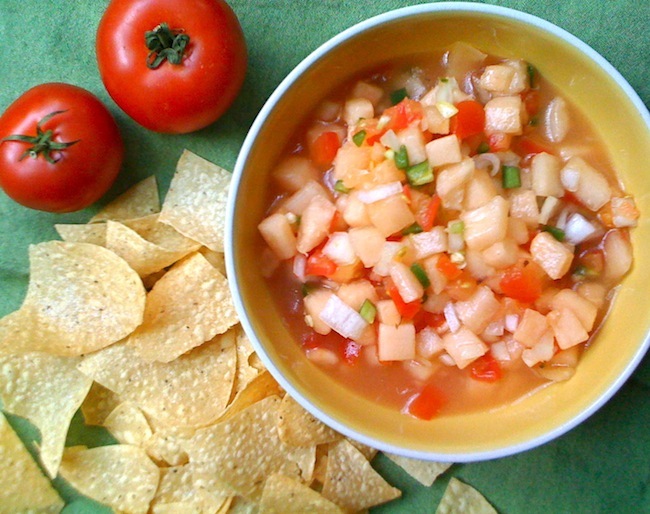 Chop the melon, onion, and tomatoes to the same size and add to a glass bowl. Chop jalapenos (seed and remove white pith if you want it less spicy), and add to bowl. Juice the lime with a fork or citrus juicer into another small glass bowl, strain and add liquid to the other ingredients. Stir. Add salt to taste. Cover and place in refrigerator for one hour to allow the juices and flavors to get to know one another. Pull from refrigerator 10 minutes before serving. Serve in glass or ceramic bowls with the best corn tortilla chips you can find. Drink Suggestions: Good crisp Mexican beer, or margaritas with rims coated in chili and salt. With a history of more than 700 years, the hami melon is a type of muskmelon originally from the Shanshan County of Xinjiang in China. You can find them in most Asian markets and from time to time in regular grocery stores during the summer. Usually oblong in shape, but not without variation, their flavor is deliciously sweet and flavorful. This post is dedicated to Merle Dean Burchardt. Miss you, Granddaddy.